Tonight's red post collection includes information on the March 11th Patch update to fix issues with Azir and Kog'Maw, a heads up that Jhin's color text will be up Monday with others coming soon, videos of the Tribeca Game's League of Legends panels, and more! Jhin's Color Text to be added Monday and others soon! The official 6.5 patch notes have been updated to reflect two hotfixes that went out on March 10th and March 11th to fix up bugs with Azir, Kog'Maw, and Twisted Fate! WHY AREN'T THEY MELTING - Fixed a bug that caused on-hit effects to deal significantly reduced damage while W - Bio-Arcane Barrage was active"
WAARGHbobo has posted that, after several delays, Jhin's story will be added to his champion page on Monday March 14th! WAARGHbobo also mentions several other champions have stories that will be released very soon. Just a quick heads up. I was informed Jhin's color text will be shipping Monday (USA PST). I'm gonna set aside a couple hours on Tuesday to answer questions about the story and Jhin. In related news Tahm , Sivir, and Rek Sai's new lores will be shipping soon too!" "Color Text" refers to the little short story that appears after the bio"
"And Ekko's as well. I think Bard, too." "It's in the pipeline at the moment." "Hey dudes, we removed these from champ select. 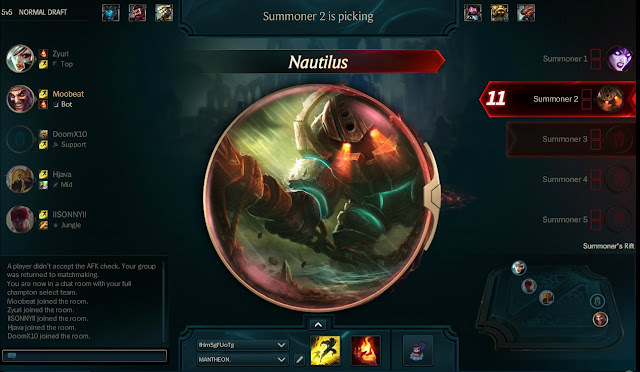 The issue was we had overloaded champ select with too many sound effects, making it hard to tell when key things were actually going on - like when it was your turn to pick. You'll still hear your own champ when you lock them in. The upside of this is that since the recent patch we're seeing some of the lowest dodge rates ever." "To clarify, this was part of a package of fixes that improved dodge rates. When we saw dodge rates weren't where we wanted them, this was something we were okay trading to make sure dodge rates are in a healthy place. Definitely not saying this change alone caused improvement here, but it was one of the factors we targeted." "Right, and the problem is that the champion quotes can be pretty long and would actually stomp the "your turn to pick" sound. A further refinement could be muting the champion quote if you're picking next or fading it out when your turn starts. That was more complicated and we had some high priority fixes that we were working on so we kept it simple. I do hear you, though, we all loved the champion quotes and thought they were a great way to add more flavor to the experience." 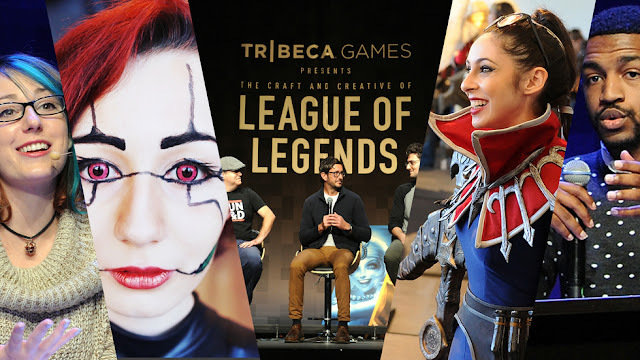 Next up is a set of six videos of the various League of Legends panels from Tribeca Games event in late 2015. These videos were all recently uploaded to the Riot Games youtube channel and feature all sorts of Rioters - artists, designers, musicians, and more - discussing their craft! More photos from the event can be found here via the Tribeca website. We also have a brand new community collaboration champion mix - Lee Sin Mix! "Domics and Jomm took Lee Sin's voice and remixed it. Master yourself, master the enemy. "That’s always a tough one. It’s like picking your favorite pet or child. I like the thematic and story of Bard and Kindred a lot. I appreciate the gameplay of Orianna. I like how resonant Riven and Jinx are with players. "We think there is a point at which League will have too many champions, but at the rate we release new champions, that date is still years away. 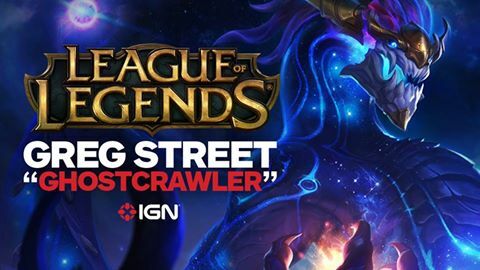 "What are the future plans for League of legends balance between champions being release and champions being balanced? "We actually split gameplay changes among several teams. The ones you are likely most familiar with are live gameplay, new champions, champion updates, and systems changes (like say items, gold or towers). We have slowed down on champion releases a lot. We used to do like 12+ a year. Recently it has only been like 5-6 and we’d like to improve that a little. "Absolutely. We don’t willingly design overpowered champions but it definitely happens. Sometimes players figure out ways to play champions that we didn’t expect, particularly depending on the lane they use or the items they choose. Sometimes players master a play style faster than we expected. Sometimes there is just a bug. "It’s not something we are working on today. League is very married to having a mouse and keyboard. If we developed a version on another platform, it would need to be thought about totally differently. If you look at what Blizzard did with Diablo 3, the console version still felt very much like Diablo, but they changed it enough to make sense with a different control scheme. "League ships in a lot of different countries and all of those places have different laws and depictions of tobacco use is one of those areas that gets tricky to navigate. It can depend a lot on how prominent the display is, which is why a cinematic might get different scrutiny than splash art. "We collect a great deal of data about how champions perform through the game itself. Sometimes this meshes with what players see on fansites and sometimes it doesn’t.